Miss Moonshine's Emporium of Happy Endings is a wonderful book filled with nine amazing stories by different authors about Miss Moonshine and her incredible shop. I was mesmerized by each item in Miss Moonshine's emporium. The lady knows exactly what someone needs and she's fabulously wise. This is something that comes back in each story. I loved that the stories are linked, each author writes about the same Miss Moonshine, but builds a unique story around her. It works very well and one of the reasons for this is that the quality of all the stories is constant. They are true gems and I liked their originality, charm and little spark of magic. Each Miss Moonshine story is set in Haven Bridge. There's a large variety of wonderful fascinating characters from different times and places. Miss Moonshine brings people together, she unites in a beautiful way. Miss Moonshine's Emporium of Happy Endings is a celebration of life and love. There's so much goodness and sunshine in this book and that put a big smile on my face. I love it when I'm reading something that makes me happy and this book definitely fell into that category. The stories go well together, they are unique and the voice of each author can clearly be recognized, but they are also part of a whole. I was completely amazed by Miss Moonshine's Emporium of Happy Endings and highly recommend this fantastic book. If you love short stories that are all linked set in a small town with a fantastic magical shop that evolve around true love you don't want to miss Miss Moonshine's Emporium of Happy Endings. On 19th May this year, Prince Harry married his princess (or Duchess, as she’ll be known) in a beautiful ceremony at Windsor Castle. I was glued to the screen from start to finish, loving every moment. Prince Harry is my favourite of the royal family. I wonder if he would really have much preferred a simple ceremony, with just his brother and his friends – and no television cameras. But the day passed off in the most perfect way, with the bride looking gorgeous and the two of them looking very much in love. The bride’s mother looked like she was about to cry tears of joy at any moment. How we all love a happy ending! The day before the royal wedding, eight author friends and I released a collection of stories called Miss Moonshine’s Emporium of Happy Endings. Miss Moonshine is the mysterious shopkeeper who ties all our stories together. Our Miss Moonshine seems to sell just a collection of bric-a-brac – and yet whenever anyone comes to her shop, they always find exactly what they need, and they also find fulfilment and a happy ending. We’ve been very touched by the response so far to our collection. So many readers have loved the idea of our quirky shopkeeper, and particularly of the happy endings she provides. Harry and Meghan’s wedding brought a spark of happiness and colour to the depressing news we see every day. Many people have lives filled with sadness and trauma. I can perfectly understand why readers have taken our stories to heart. The idea of a Miss Moonshine who takes your troubles and turns them into a happy ending has caught the imagination of many, and it’s been a real and unexpected delight to offer readers a chance to experience what one reviewer called, “a little bit of hope and magic”. Nine romantic novelists from Yorkshire and Lancashire, including best-selling and award-winning authors, have joined together to create this collection of uplifting stories guaranteed to warm your heart. This intriguing mix of historical and contemporary romances will make you laugh, cry, and believe in the happy-ever-after. Thank you so much for having us, Anniek and Suze! 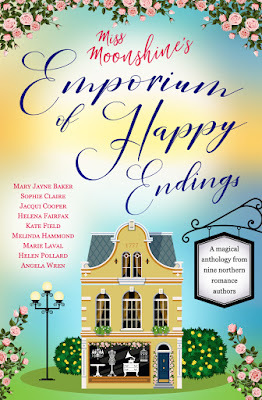 One very lucky reader of With Love for Books will receive a paperback copy of Miss Moonshine’s Emporium of Happy Endings by Helena Fairfax, Helen Pollard and others. 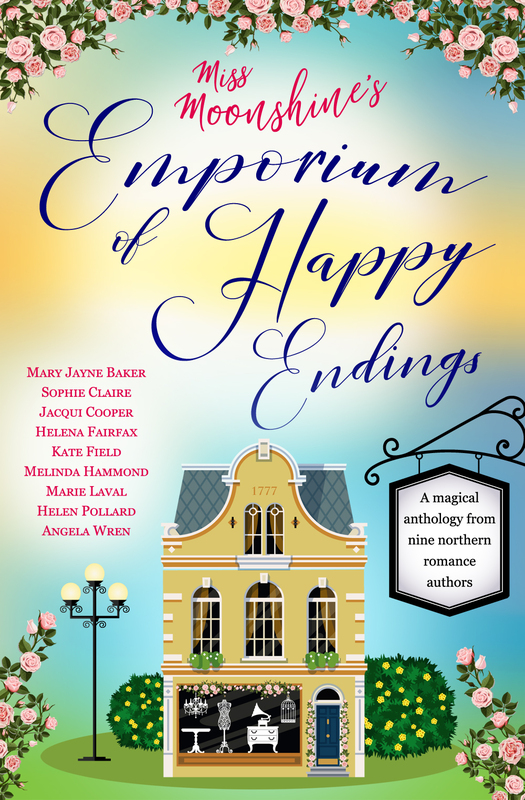 Miss Moonshine's Emporium of Happy Endings sounds like a wonderful collection of short stories by a very talented group of authors. Thank you so much, Solange. We had great fun writing it. Thanks for dropping in! fantastic giveaway, I love this kind of collection, always interesting! Thanks so much, Kitty! I'm really chuffed you're enjoying the stories! This all sounds wonderful thank you. Your book sounds utterly charming and I'd really love to discover Miss Moonshine's wonderful shop! Thanks for your lovely comment, Birgit, and for dropping in! Thank you so much, Ellen, and thanks for dropping in! Looks like my kind of book I would love to read it. It sounds like an amazing reading for my summer holidays. Thank you for the giveaway! Thank you so much, Billy. Hope you have a great summer! Thank you, Judy - and thanks so much for dropping in! Love the cover, it makes you want to "open the door" and investigate the magic inside. Sounds a great collection of short stories from, admittedly, authors I've not had the pleasure of reading yet. Thank you, Tracy! Our cover designer, Mary Jayne Baker, also wrote one of the stories. She's very talented! Thanks so much for dropping in! Exciting. Love to discover the stories. The characters sounds wonderful. Thanks for your lovely comment, Leila! Such a wonderful cover! I'm so excited to read your story. Suze did a wonderful job with her review. Thank you, Irma. Suze gave us a lovely review. We were all very touched by it. Thanks for dropping in! Thank you for taking part, Carole! I love the ideas of the short stories all being linked together by a quirky shop. Thank you, Angela. It was great fun coming up with ideas, and we've grown to love Miss Moonshine like a real character. Thanks for dropping in, and for your comment! You can't beat a good book, to lie back with in the Summertime. Looks a great read! Thanks so much, Stephanie. Have a great weekend! Thank you, Adrian. Good luck! This sounds like such a lovely and uplifting read. Perfect for out in the garden, with a glass of wine in hand. Thanks, Katrina. That's a lovely image! Thanks for dropping in! What a wonderfully whimsical title! Thank you, Kate! Our cover designer, Mary Jayne Baker, came up with the title. Mary Jayne also wrote one of the stories in the anthology. She's very talented! Thanks for dropping in! I enjoyed the guest post and the idea of a Miss Moonshine. I'd certainly love to visit her emporium and browse around. How on earth did you all come up with this idea? It sounds like the book has had a great response and is very much appreciated. Hi Eliza, thanks for dropping in! We all love Miss Moonshine now and we think of her as a real person. We came up with the idea as we were having lunch together in Hebden Bridge. We wanted something that would tie all our stories together, and that would work both for historical stories and for contemporary. We discussed and discarded quite a few things - the idea of having the same opening paragraph for each story, for example, or the idea of having the same item (a piece of jewellery? a wedding dress?) in each story. None of these fired our imagination. Then we hit on the idea of having the same character. Hebden Bridge is full of wonderful shops, in buildings that have been there for hundreds of years. We decided to have our central character a shopkeeper - and so Miss Moonshine was born! We'd all love to visit her emporium, and we often discuss what we'd come away with :) I'm so glad you enjoyed the post and our idea. We are working on another collection to come out next year. Miss Moonshine is still going strong! Wow, Hebden Bridge, my late brother used to live in Smithy Bridge and we often went on trips to Hebden Bridge, in fact I even stayed there with my own family many many moons ago :-) With 7 kids there was no room for us all at my brother's. It's a lovely town now, Eliza - really vibrant and lively atmosphere. Great shops, cafes and restaurants, and lovely walks along the canal and up to Heptonstall. I hope you get to revisit one day. Thanks for dropping in, and for your great comment!